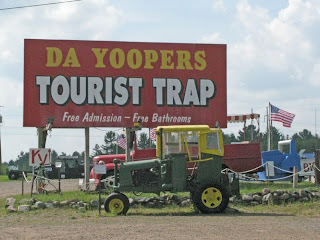 "Yoopers want you to know how lucky they are to live in such a beautiful place, how hard it is to do that, how their jokes about themselves are funnier than anything you've heard — and why you shouldn't move there. Just visit. Anytime. Come again. And next time ship the thimbleberry jelly home." "The Upper Peninsula's economy "is struggling, like most economies, especially when you put it in the context of the Michigan economy as a whole. Michigan leads the nation in unemployment," Ferrarini says. "We've got Baraga County, where one out of every four people are unemployed, but then you look at Mackinac County and you see we have about 2 percent there because of the tourism surrounding the island, Mackinac Island, a beautiful place." Although there are pockets of high unemployment on the Upper Peninsula of Michigan, the economy there is relatively stable despite the recession. Lahti credits the diversity of industries, including minerals, forestry, tourism and agriculture." "The meat turnover was brought to Michigan's Upper Peninsula by immigrant miners from Cornwall, England, and "Yoopers" — the local population — are very opinionated about them. A pasty is a small circle of pie crust filled with meat, potatoes, onions and spices. Some have carrots. The pasty at Lawry's Pasty Shop in Marquette — voted best by the local newspaper — has rutabaga." Weekend Edition Sunday explores the culture, traditions and economy of Michigan's Upper Peninsula. at first I thought you were going to talk about the other bloodless battle over state lines. When we were kids Gram N talked about the U.p trying to leave the lower penninsula and become its own state. Seems the mitten had more say and couldnt afford to let it's northlands go. They should have seceded from the Union and joined Canada.